We are a non-profit organisation dedicated to providing residential and vocational programs. We support adults with intellectual disabilities from the Town and County of Antigonish in their pursuit of quality living and work experiences. We operate on funding provided by the province, community partners and revenue from sales of products and services. Community support and the partnership of local businesses are very important to the continued operation of our programs and services. 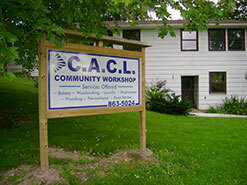 The goals of the Antigonish CACL have evolved over the years and we are working toward wage parity for our program participants as valued members of the community like any other. While there have been great strides in progress, much remains to be done. The ongoing modernization of our services demands diligent and attentive stewardship of our organization. Raising the bar for standards of service and setting the example for community participation is where the Town and County of Antigonish and its businesses continues to excel and we are proud to continue to be a part of the efforts that help our community shine.